The best four networks (MTN, Glo, 9mobile and Airtel) in Nigeria now have double data offer bonus for their customers. The doubling of data offer gives subscribers the ability to get times two (X2) of their purchased data. The feature was first launched by MTN before other networks followed suite and therefore, it has make browsing more good as subscribers can now stay on the internet for a longer period of time. Before this offer, whenever I purchase a data plan, it gets finished quickly because normal data plans are very cost. Since, I have come across the doubling of data, my internet life totally changed. So, if you see that your network is too slow in your location, you can switch to other network and activate the double data. You are not restricted to only one network. 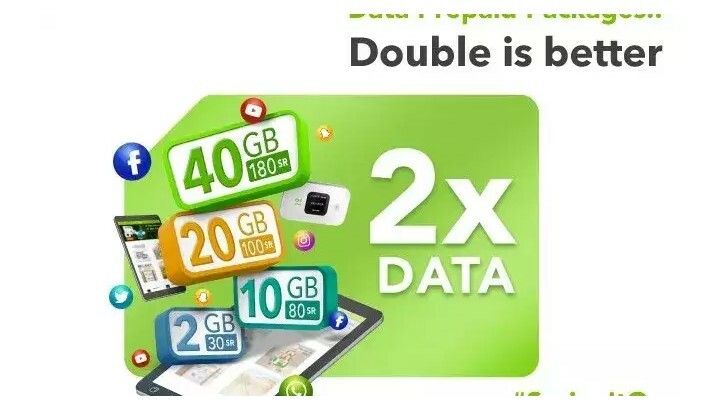 The double data bonus doesn’t zap, it works perfectly on any type of phone that can access the internet e.g Android, iOS, tablet, desktop/PC and among others. If you are the type that download heavily in both night and day, you will find this article very helpful for your day-to-day activities and internet life. Normally, you receive the bonus offer automatically from MTN but if you haven’t received the message, you can send DOUBLE, PROMO and FREE to 131 as text message. When you get reply, you can then recharge and get your double data offer activated. Note that, it depends on eligibility. Now, dial *131# and purchase any data plan from the list and your data will be doubled. Remember to check your data balance by dialling *131*4# and enjoy! Airtel double data doesn’t base on eligibility. You can dial *144# and purchase any of the applicable data plans. Immediately, the purchased data will be doubled. Remember to check your data balance by dialling *140# and note that the double data offer lasts for 6 months but your purchased validity period based on the type of data plan you bought. Glo 100% double data doesn’t based on eligibility i.e it can be enjoyed by all Glo subscribers. Even new and existing customers are eligible. Firstly, buy any Glo official data plan by dialling *777# and leave the auto-renewal. Once your previous purchased data finishes, the next data plan that will be auto-renewed, will be doubled automatically. Remember to always check your data balance by dialling *127*0# and enjoy! The double data bonus offer of 9mobile doesn’t base on eligibility but on tariff plan. If you are using 9mobile network, you can migrate to Morecliq tariff plan by dialling *244*1# to enjoy the offer. After successful migration, dial *545# and activate the 100% double data offer. Now, subscribe to any 9mobile data plan and it will be doubled immediately. Remember to check your data balance by dialling *228# and enjoy! The double data offer are the best feature to activate on any networks in Nigeria rather than wasting money on little data plans. They doesn’t zap but are official data plans from the network providers.The doubled data can be used to stream videos, download, surf and browse, just like that of the official data plans. Is it helpful? Encounter any problems? Kindly ask more questions and if it works for you, kindly share your experience and SHARE THIS POST to your friends and family!